Saturday 7th July 2018 was a special day in the history of married couples at All Saints’ Cathedral, Kampala. The Marrieds Home Coming and Thanksgiving brought together more than 250 couples to thank and praise God and renew their wedding vows. Among the couples were those who have been married for 48 years (oldest) and three weeks (youngest). While preaching, the former Archbishop of the Church of Uganda, Bishop Henry Luke Orombi encouraged the couples to be committed to one another so that the devil does not tempt them. Bishop Orombi said that marriage is a journey that starts out of faith. “You come from your parents and you don’t know this person, but you believe things will work out as you wish. You were given that precious gift (wife) through her parents,” he told the husbands in attendance. Alluding to the story of Adam and Eve in the bible, he decried male absenteeism from homes and challenged them to get involved in their family affairs. He also encouraged the couples to always seek for forgiveness whenever they are in the wrong. Bishop Orombi challenged men to be the fathers their children will look up to in future. “It is your role as a father to give assurance to your family that all is okay.” In his closing remarks, he encouraged the couples to look up to Jesus their saviour, no matter their circumstances. “Don’t look at your material possessions, children or your spouse. Instead, look up to Jesus who came that you may have life and have it in its fullness,” he said. 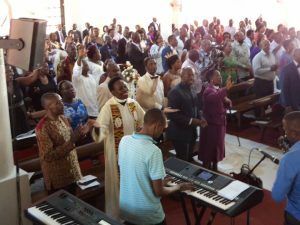 The home coming was characterized by renewal of wedding vows and thanksgiving, accompanied by the melodic voices of the Angelican Flames choir. The couples thanked the Cathedral Administration and the Family Life Ministery for organising a wonderful event that has blessed them. 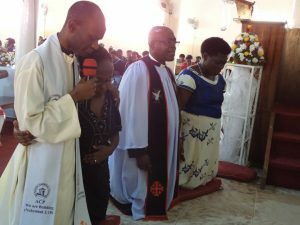 The couples’ Home Coming comes at a time when the Church of Uganda is focusing on family restoration. The Provost of the Cathedral, The Very Rev. Canon Michael Mukhwana assured the couples that this is going be an Annual event.